Today’s freebie is pretty awesome. 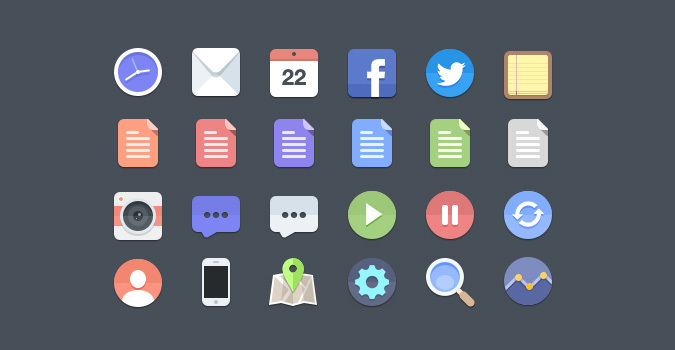 24 flat style icons contributed by super-talented Jan Dvořák. The PSD includes all 24 icons which are fully layered for easy customisation. Very nice. You should absolutely go and check out more of Jan’s work over on Dribbble. You can also give him a thanks on Twitter. Very clean, nice job and thanks for sharing! Really really great! Thanks so much for the free download! Really appreciate such downloads! Wow. These are fantastic! Real beauts, and a real inspiration. Cheers! thanks a lot for this impressive collection.. Thanks – they’re pretty handy!! Nice and very handy thanks! Everything seems to be moving to more of a flat design lately (I like it too). Clean and crisp. Thanks for sharing this. Excellent icons, perfect for metro styles. Thanks for giving free your hard work. I’m very much thankful for this flat icons, I used flat icons in all my website design because most of my clients like flat designs. I’m so glad that i have found your article. Love all your artworks, but especially these icons will be very useful for my project. Thanks for taking sharing them for free.